* Complete warranty details available from your local dealer or at www.amana-hac.com. To receive the Lifetime Unit Replacement Limited Warranty (good for as long as you own your home) and 10-Year Parts Limited Warranty, online registration must be completed within 60 days of installation. Online registration is not required in California or Quebec. When your new heat pump is paired with an Amana® brand gas furnace with ComfortBridge technology, performance data from the spilt system is gathered and used to make automatic adjustments that may help reduce the amount of energy used to cool your home. Always in pursuit of innovative ideas, our engineers have designed ComfortBridge technology to help your entire HVAC system cost-effectively operate at peak performance — providing consistent energy-efficient home comfort. ComfortBridge technology works with any single-stage thermostat to help create customized indoor comfort specifically for you and your family. Engineered into all premium Amana brand units, ComfortAlert enables the performance of your heat pump to be remotely monitored by your HVAC contractor. Proactively detecting operational deficiencies and potential systems issues not only helps ensure uninterrupted comfort; it prevents minor service requirements from becoming major repairs. The compressor in your new heat pump system is covered by a Lifetime Unit Replacement Limited Warranty* on selected gas furnace, air conditioner and heat pump models, good for as long as the purchaser owns his/her home. If the compressor or heat exchanger fails in use at the original registered homeowner’s residence, a new furnace or condenser will be provided at no charge. All remaining functional parts are covered by a 10-Year Parts Limited Warranty*. For a full description of all warranties applicable to this product, please see your local Amana brand dealer or click on the consumer brochure and product warranty links above. Year-round exceptional heating and cooling energy efficiency, improved temperature and humidity control, make this unit to be what we believe is one of our best heat pumps available. Proper sizing and installation of equipment is critical to achieve optimal performance. 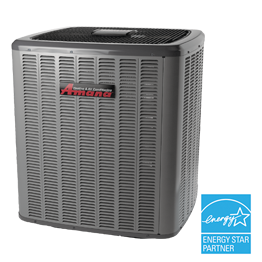 Split system air conditioners and heat pumps must be matched with appropriate coil components to meet ENERGY STAR® criteria. Ask your contractor for details or visit www.energystar.gov.